Manatees and dugongs are affectionately dubbed “sea cows” because of their grass-eating tendencies and slow nature. They are often seen swimming gracefully with their powerful tails and flippers. But, did you know that manatees may have been the inspiration behind many sailors’ tales of sirens and mermaids? History Channel reported that during Christopher Columbus’ first trip to the Americas, his company recorded a sighting of three mermaids in the waters surrounding the island of Haiti. He reported seeing these mermaids rise from the sea near his route. Later it was discovered that these mythical mermaids were most likely manatees. We love the slow and gentle nature of manatees and dugongs. Since the behavior and characteristics of manatees and dugongs are fairly similar, they are often confused for one another, but we’re here to help! We’ve put together the key differences that separate the two below. Manatees are thought to have evolved from four-legged land mammals more than 60 million years ago, their closest relative outside of dugongs being the elephant. There are three different manatee species: the Amazonian manatee (Trichechus inunguis), the America or West Indian manatee (Trichechus manatus) and the African manatee (Trichechus senegalensis). These aquatic mammals are usually a gray-brown with a flat, paddle-shaped tail, two flippers and a whiskered snout. All manatees, with the exception of the Amazonian manatee, have vestigial toenails, appendages rendered useless over evolution and reminiscent of the claws they once had as land animals. Despite having small eyes and no external ear structures, manatees have fairly good eyesight and hearing. They have a special membrane that protects their eyes and large, inner ear bones. Also unique to manatees is their lack of a seventh neck vertebrae, which means they can’t turn their head without turning their entire body. The average lifespan of a manatee is around 40 years, in which they can grow between eight and thirteen feet. Dugongs (Dugong dugong) are closely related to manatees and are the fourth species under the order sirenia. Unlike manatees, dugongs have a fluked tail, similar to a whale’s, and a large snout with an upper lip that protrudes over their mouth and bristles instead of whiskers. Dugongs are born a pale, cream color and darken to a slate gray as they age, which is around 70 years on average. Another defining feature is that adult males and some old females develop small tusks, which males use for fighting during mating season. Dugongs also have good hearing, but unlike manatees, their eyesight is very poor. Adult dugongs are usually around eight to ten feet in length. Relative to their species name, manatees are found in specific parts of the world. The Amazonian manatees stick to the Amazon River, the African manatee lives along the west coast of Africa and the American or West Indian manatee is found on the east coast from Florida to Brazil. Regardless of what part of the world they are found in, manatees tend to stay in shallow waters, since they need to resurface for air. A resting manatee can remain submerged up to 15 minutes, but when active they must resurface every three or four minutes. Manatees usually swim alone or in pairs, but can form small groups, called aggregates, during mating season or if there’s a particularly large feast of grass. Dugongs live in the coastal waters of East Africa to Australia with most of the population residing in northern Australian waters. They prefer shallow, warm areas with high concentrations of sea grass and are rarely found in rivers, unlike manatees. Dugongs are usually spotted alone or in pairs, but can gather in large herds consisting of nearly a hundred. The exact gestation period for a dugong is unknown, but it’s estimated at about a year. Similarly to manatees, dugongs give birth to their young in the coastal waters, where the calves swim to the surface for their first breath. Manatees are herbivores and possess molars to feed on aquatic plants. When at sea, they prefer sea grass and when in rivers munch on freshwater vegetation. Because plants have such low nutritional value, manatees must graze for six to eight hours a day, consuming around 10-15% of their body weight. Manatees have also developed a lower metabolic rate allowing them to use 25% less energy than other mammals of their size. Since manatees are so large and slow-moving, they are vulnerable to motorboat accidents, crowded waters and fishing nets. Dugongs are also herbivores and have a similar diet to manatees. Dugongs have between ten to fourteen teeth along with a horny pad on their lip and palate to easily up root vegetation. Some algae and the occasional crab have been identified in the stomach of a dugong, but their stomachs are relatively simple and have a hard time digesting. 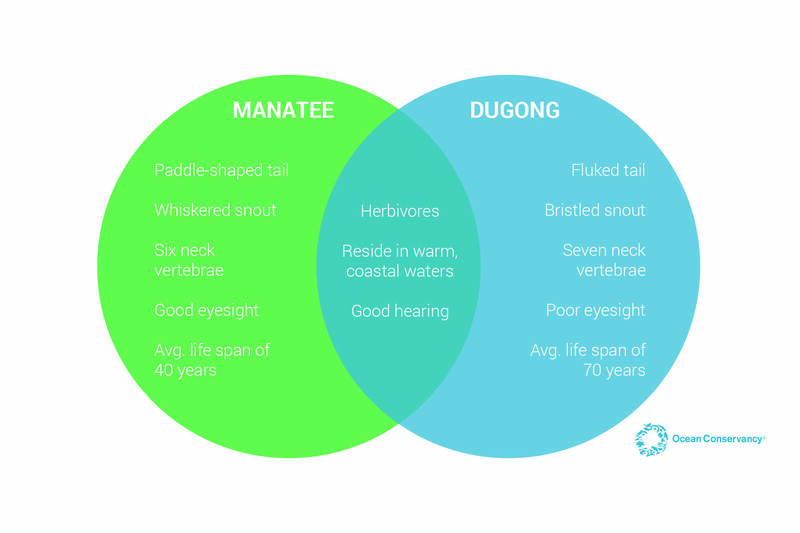 For a breakdown of key differences between manatees and dugongs, check out our diagram below. The International Union for Conservation of Nature (IUCN) lists both manatees and dugongs as vulnerable with some subspecies of manatees as endangered. It’s imperative that we share the ocean with these amazing creatures as we navigate a rapidly changing ocean landscape. Because they are unable to survive in the cold, manatees and dugongs must make the difficult journey towards warmer water each year. Boat strikes are one of the biggest threats during migration. To help the sea cows, when boating, always obey posted speed zones and go slowly in shallow waters where they tend to rest, feed and migrate. Watch for signs and never throw trash, debris or fishing line overboard. Even if you live inland, you can help by picking up trash that could end up in coastal and ocean waters. Spending a few extra minutes at the end of your beach visit to clean up your surroundings can benefit manatees for a lifetime. The most important way you can help is to always be respectful. If you are lucky enough to see a manatee or dugong in the wild, never disturb them. Admiring from afar is safest for you and the animals.